Unisex ~ a great gift for both men and women! The handmade genuine semi precious stone arrowhead pendant necklace of your choice comes with either an 18" or 20" cord available in black, navy or brown with a lobster clasp closure. A one of a kind beautiful focal point for any outfit. 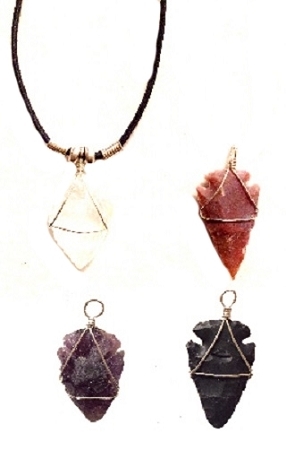 The semi precious stone arrowhead pendants measure approximately 1 5/8" including the top ring. If you would like a longer or shorter cord for your necklace, send us a message and we will make it whatever length you would like at no extra cost. Each necklace comes gift boxed. Each one is individually priced. Amethyst - (Shades of purple, lilac or mauve) is used as a dream stone and to help insomnia. Put an amethyst under your pillow to bring about pleasant dreams, or rub it across your forehead to offer relief from a headache. Worn as protection from self-deception, as well as a protection against witchcraft. The amethyst has long been used to open the spiritual and psychic centers, making it one of the power stones. It is also used as a meditation aid when worn as a necklace. Clear Quartz ~ (clear) is a receiver, conductor and generator of energy. Used for meditation, transformation, stability, knowledge, protection, healing and enlightenment. Aids in general good health and increases auric field. Obsidian - (Opaque black) is a very protective stone and is excellent for removing negativity. It is also excellent protection against psychic attacks. Red Jasper ~ (light brick color) is called the stone of fairness and justice because its energy is used to decrease injustice and help in unfair situations. It is is used to protect from EMF and other radiation as well. It is said to be outstanding for promoting survival and overcoming survival issues. It has very nurturing energy and can help with ancestral/inherited issues.